September is here and we're feeling particularly excited for all our clients headed to Croatia this month. With them in mind, and because you know how much we love food, we've got a round up of the best eats along the coast from one of our most trusted guides, Shirin from Travel in Style. The luxurious marina village of Porto Montenegro, full of designer shops and fine restuarants, offers plenty of gastronomic experiences. Enjoy Italian fine dining and amazing views in Al Posto Giusto, try refined Mediterranean cuisine at De Gustibus, or give the newly opened Byblos a try for a sophisticated conceptual Lebanese experience. One offers the best examples of Adriatic cuisine while Mitsu has the best sushi on the entire Adriatic Sea. Closer to the beautiful town of Kotor, Stari Mlini has a well-deserved reputation for both its beautiful setting--overlooking a river--and its exceptional food. Finally, Kotor Bay's most sophisticated restaurant is Galion, with panoramic views and a romantic atmosphere. Specializing in fresh local seafood, as well as with a substantial list of other meat and vegetarian dishes, Galion is not to be missed. Nautika, one of the top ten most romantic restaurants in the world, offers fabulous food, service, and two panoramic terraces for an unbeatable dinner experience. Head to Gil's, a tiny bistro in Old Town, for lunch or dinner. It offers a unique culinary experience with a wide variety of steaks, along with truffle based dishes and fresh local oysters from the nearby city Ston. 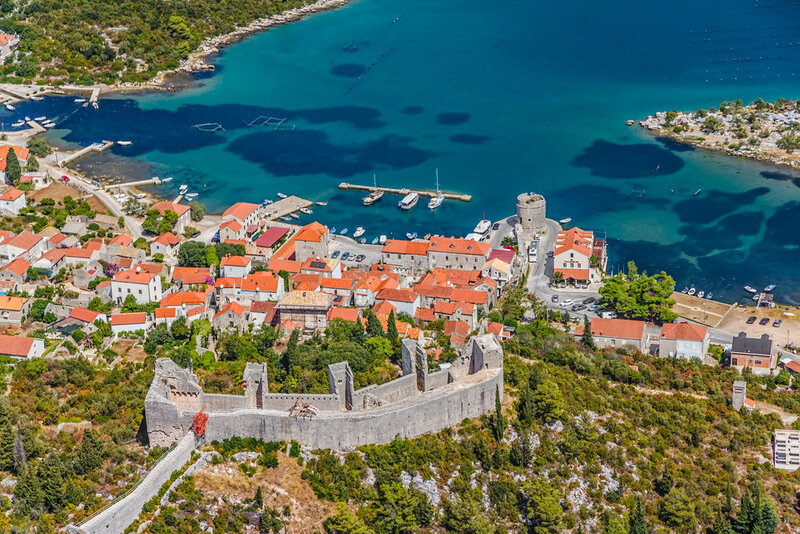 360 is set within the great walls of Dubrovnik and offers impressive views over the port. This dinner-only restaurant effortlessly blends its historical setting with a creative cuisine. Finally, make a quick stop for drinks at Buza Bar, a unique cliffside cafe accessed by holes in the castle walls of Old Town. Don't miss the old wooden sign that says "Cold Drinks With the Most Beautiful View" which points to the only entrance. Restaurant Maestral is a hidden gem, overlooking a beautiful bay, and serving simple well-prepared dishes from freshly caught fish and octopus. Satisfy your seafood cravings at lunch or dinner. Restaurant Stermasi is a small family restaurant serving organic home made dishes for lunch and dinner, using fish caught daily. It's set in the pine trees above lovely Maranovici Bay on the southeast tip of Mljet. Located in the elegant Lešić-Dimitri Palace Hotel the panoramic LD Terrace is an idyllic spot to enjoy lunch or dinner with some of Dalmatia’s finest cuisine and wine with amazing sea and island views. A long-standing Korcula favourite in the old town, Adio Mare offers traditional cuisine for lunch and dinner. Reserve a table on the roof terrace as it gets busy. Occupying a prized spot in the old town, Filippi serves traditional dishes for lunch and dinner such as octopus salad and home-made macaroni with a modern twist. Konoba More, the waterside restaurant serving lunch and dinner in the quaint Lumbarda village is popular for its lobster pasta, made with enormous crustaceans from its own sea pond. Located in what remains of a 15th century Venetian palace, Giaxa is one of Hvar’s best restaurants for dinner, offering a gourmet twist on Croatian cooking. Zori is an elegant restaurant on the exclusive islet of Palmizana serving fine international cuisine for lunch and dinner. Restuarant Kod Barba Luke is a lovely family restaurant on the main square of Stari Grad, within the UNESCO protected world heritage site, offering delicious Croatian and Mediterranean specialties. Situated on a picturesque waterfront, Gariful is Croatia’s most luxurious fish restaurant renowned for its top notch seafood and outstanding wine and Champagne list attracting many VIP guests. Kapetanova Kuca is arguably the best place to savor the famous oysters of Ston, for lunch or dinner. Gastro Mare is a destination restaurant, the love-project of a local chef who takes the ingredients from the sea in front of him and from the garden at his back door and cooks them to perfection with plenty of imagination. Obala offers fine dining right on the seafront promenade with idyllic sunset views across the bay. Situated in the garden of the 16th-century Garibaldi mansion, Villa Kaliopa serves great Dalmatian cuisine in a beautiful setting under the palm trees. Frequented by yachtsmen for lunch and dinner. An old lobster tavern, Konoba Jastozera, sits above the sea serving several tantalizing versions of lobster. Also, there are grills, steaks and an extensive selection of domestic wines. Offering an inland dining experience on a working vineyard, in an open courtyard next to Vis cricket ground (formerly the World War II airstrip), Roki’s is high on any must-visit list. The must have? Their peka, a typical Croatian dish that is slow-cooked under a bell shaped cover over coals. The dish must be ordered the day prior or when you book. Vis Island’s best known restaurant, Restaurant Pojoda offers amazing interpretations of local Vis cooking in a hidden garden setting. Overlooking the sea and the greenery from above the village of Supetar, Agroturizam Ranjak offers ecological food with ingredients grown in household and a lovely rustic atmosphere set amidst the olive trees. Located at Dalmatia’s most famous beach Zlatni Rat, Auro Beach & Lounge Bar is an ideal place under the shade of trees to have a refreshing drink and a light lunch. Enjoy contemporary versions of Dalmatian specialties the old typical stone house of Taverna Riva. It offers amazing views over the harbor and Hvar Island form its lovely veranda. Located in a traditional 16th century castello overlooking the village of Dol and the surrounding valley, Konoba Dol - Kastil Gospodnetic offers great Dalmatian specialties in a priceless atmosphere. Restaurant Kadena is sleek and elegant, with a spacious terrace overlooking the sea and surrounding islands. Kadena serves the freshest seafood and vegetables. Inspired by the La Boqueira market in Barcelona, Bokeria is a hip restaurant and wine house modern offering simple meals from Croatia and the Mediterrenean made only with seasonal ingredients. Split’s finest restaurant, Paradigma Restaurant, offers contemporary Dalmatian cuisine using local flavors mixed with fresh ingredients inspired from Greece, Southern Italy, Provence and Spain. Enjoy the cuisine on the superb rooftop terrace. Zrno Soli is a stylish restaurant located at the ACI Marina, with views of the yachts and Diocletian’s Palace across the bay. It offers updated Croatian staples and Mediterranean specialties. Located in a stone-clad basement of a century-old building, Ma:toni offers non-conventional creations of fish and meat and imaginative vegan-inspired dishes unlike many other venues with orthodox traditional Dalmatian cuisine. Its dungeon-like setting provides welcome refreshment on hot days. Located in the middle of the old town, Calebotta is one of the finer restaurants in Trogir with wonderful outdoor seating in the hidden garden, where you can peacefuly enjoy great examples of international cuisine. One of the oldest establishments in Trogir, Alka offers Adriatic specialities and carefully chosen international dishes in a beautiful ambiance. We don't blame you if you're hungry--or want to jet set off to Croatia--after reading this post. Click the link below to contact Travel In Style--let 'em know Passported sent you and you'll be in great hands!